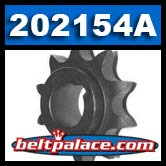 Comet 202154A - 1-Pack of "202154-A” sprocket on TAV Series by Comet Industries. 9 Tooth sprocket for Comet Industries Torque-a-verter. Comet 202154A - OEM Heavy Duty 9 Tooth Sprocket on TAV Series Comet Industries, 5/8” Bore, #40 Chain. Replaces KENBAR/MANCO 1125. Comet Heavy Duty Chain Sprocket, Comet part# 302656C. Comet jackshaft sprocket kit 202154-A. 5/8” Bore, #40/41 Chain (1/2” Pitch), 9 Tooth. For use with Comet TAV Series, Ken-Bar, Manco Centrifugal Clutch units such as Comet TAV (Torque-A-Verter). OEM PART: Replaces KENBAR/MANCO 1125.